Captain Laurie Wright of Australia has marlin fishing in his blood; his great-uncle was respected Australian angler Errol Bullen, a friend of author Zane Grey and famous for his rods and reels. Growing up on Queensland’s Sunshine Coast, Wright fished and dived and began his professional career with a Cairns mother ship operation. In 1983, he launched his own charter business and promptly caught a grander. Early in his career, he landed his largest fish- a 1,277-pound black marlin. He is responsible for many world records, including the men’s black marlin on eight-pound-test line and the women’s black marlin on 30-pound-test which still stand today. Although he has fished all over the world, Wright was always a key promoter of the legendary Cairns marlin fishery. IGFA Hall of Famer Dr. Guy Harvey dedicated an entire chapter of his book "Portraits of the Deep" to the Great Barrier Reef and his adventures with Wright. Wright served as President of the Cairns Professional Game Fishing Association from 2001 to 2007 and was instrumental in the planning and establishment of the Great Barrier Reef Marine Park. He was inducted into the Cairns Game Fishing Hall of Fame in 2008. In 2010, Wright received the IGFA Gil Keech Heavy Tackle Award for his angling prowess. 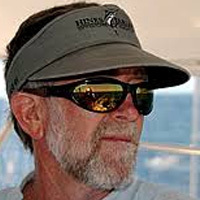 In 2011, he won the Elwood K. Harry Fellow Award for his outstanding contributions to the sport of recreational fishing. Wright still runs a number of charter and private boats during the black marlin season in Cairns and beyond.